At IKS Locksmiths we are Master Locksmiths Association Approved, North London based home security specialists. It is so important for you and your family to feel safe and secure in your home. However with over a staggering 71,554 burglaries reported across London in the last year the need for excellent home security is increasingly important. Physical home security measures are of the upmost importance. Without the correct physical security measures your home is susceptible to burglaries and you may not meet the requirements of your home contents policy. 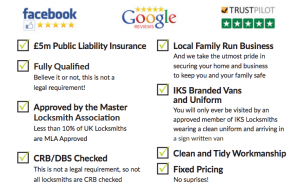 Why Choose IKS North London Home Security Services? 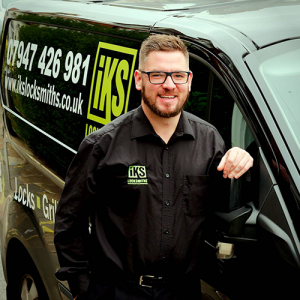 You can trust IKS Locksmiths to secure your home and everything and everyone in it. 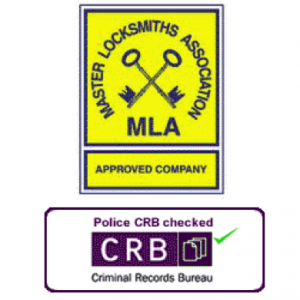 We are MLA approved home security locksmiths based in Barnet, North London and we tick all the boxes! It is so important to take care when choosing a locksmith and ensure that they have good credentials. 100% satisfied customers is our aim! 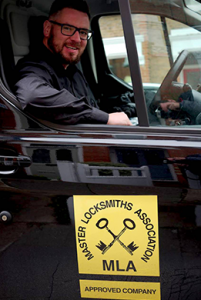 Read here about the importance of choosing a Master Locksmiths Association Approved Locksmith. Safes – This is the best way to protect your valuables and we can help to choose a safe and the best place to install it. Security Accessories and Door Furniture – Choose from a range of door furniture like spy holes and letter boxes that can complement the decor of your home. We also provide door closer installation services and fit other security accessories such as hinges bolts, Birmingham bars and London bars which can reinforce your doors and increase your overall security levels. We operate as home and business security locksmiths across London, South Hertfordshire and surrounding areas. Over the years we have gained invaluable experience in securing all types of properties and homes. Our workmanship is 100% guaranteed and we supply the best quality products from the top brands. So if you are looking for an MLA approved professional residential security specialist in North London we are awaiting your call. Whether you have lost your keys and need a locksmith or have been burgled and need emergency door repairs fast anywhere in the North London area we can help. Or perhaps you just want to check your overall home security levels? To maximise your home security book a free Security Survey today. We’ll carry out a free, no obligation full inspection of your property and recommend the best security solution for you. It is easy to miss potential security risks so our free security survey will highlight any areas where the security of your home could be vulnerable. We will then work with you to advise and install the most effective solutions at the right price. French windows & patio doors– These might not be the main entrance to the house but they offer alternative access for burglars and should be installed with high quailty locks and possibly patio door security gates. If you require a specialist in residential security in London we can help. As North London based home security locksmiths we are specialists in our field. Our highly trained locksmiths are on standby around the clock.